Last Logged on 2016-05-24 20:18:36. 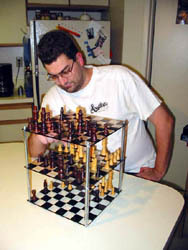 Ben is a registered chessvariants.com member. Ben is an associate author. Special areas: Piececlopedia. Specific comments on the Piececlopedia or new additions can be sent directly to Ben. For citational purposes, we keep records on anyone who contributes content to this site. Since Ben Good has contributed content to this site, our database listing on BenGood needs to stay up. But if this person is dead or no longer interested in remaining active on this site, let us know, and this account can be made inactive.